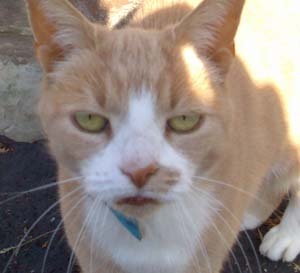 It has come to our attention that one of our oldest cats Steven, is actually called Lucy. This means that we got both gender and name wrong. The churlish amongst you might ask, “what qualifies you to run a cat review web site when you can’t even get the gender right?”. It’s a fair question, we would say “there aren’t qualifications in reviewing cats, we’re breaking new ground here, we’re living on the edge, there will be casualties. Lucy isn’t a casualty, she’s fine. We might look at her scores again but probably not. It came as a shock to all of us but Errol isn’t quite who he has been pretending to be. It has been brought to our attention that Errol is actually called Frank. We don’t think this will really affect his score very much as Frank is a good solid name. We do think Frank’s owners might want to reconsider his name. Errol seems to reflect his personality somewhat better. Obviously that is their call. Come on where have all the cats gone? We’ve reviewed pretty well every cat we’ve come across but it isn’t enough. We are desperate for more cats. So send us a picture and a little outline of what they get up to and we will do our best to get a review sorted as soon as possible. We’re not even that fussy where they live anymore. The things we need to know are:- Agility Health and vitality Home invasion Meow Fighting ability Overall cuteness Friendliness Dignity Intelligence Remaining lives Just send anything you have to contender@meowseley.co.uk and our dedicated team of cat experts will get the assessment process going.